The first project to be undertaken by the joint venture will be Krisumi City. The total build-up area of the project is expected to measure over 18 million square feet, wih an investment of $2 billion. 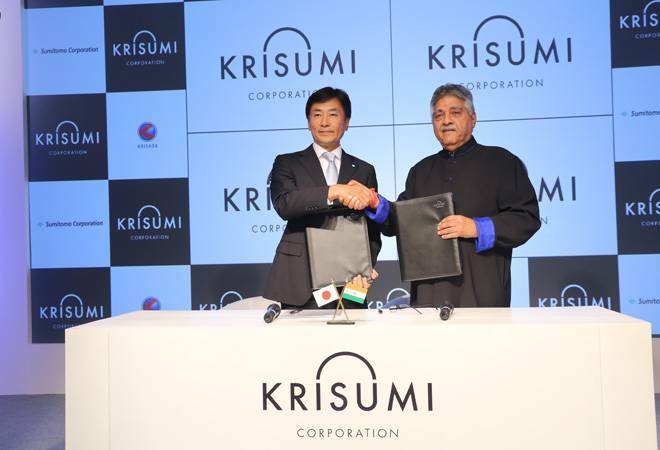 Ashok Kapur, Chairman, Krishna Group and Masahiro Narikiyo,CMD, Sumitomo Corporation India, during the MoU signing cermony at the launch of Krisumi Corporation. Japanese conglomerate Sumitomo Corporation has entered into a partnership with Gurgaon-based Krishna Group to venture into the Indian real estate sector. Both corporations have formed a joint venture, Krisumi Corporation, to develop real estate projects across the country. Both partners will have a 50:50 stake in the JV company. Announcing the partnership, Ashok Kapur, Chairman, Krishna Group, said, "The biggest challenge facing the Indian real estate industry today is with regard to quality, efficiency and commitment to timelines, all of which is exactly what Japan is known for - Japan is already beyond RERA. We are certain that our partner, Sumitomo Corporation, part of the 400 year old Sumitomo Group, with their extensive Global experience in real estate development shall contribute tremendously in creating projects with endearing value for our clients as well as the local communities around it." The first project to be undertaken by the joint venture will be Krisumi City. The total build-up area of the project is expected to measure over 18 million square feet. The Krisumi City will be developed in different phases over 4-5 years. The project will be developed on a 65-acre plot in Sector 36A of Gurgaon with an investment exceeding $2 billion. "I want to create a Japanese city here...The first phase will comprise 1.2 million square feet of built-up, consisting of 430-450 apartments and will be completed in 4-5 years," said Kapur. The Krisumi City project will be located next to the Delhi - Mumbai Industrial Corridor's Global City and right at the confluence of southern peripheral road, NH-8, Central peripheral road and the Dwarka expressway. The master plan and architectural design of Krisumi City has been developed by world renowned Japanese design firm NIKKEN SEKKEI, which has also worked on the renowned Tokyo Sky Tree. Along with apartments suited for different budget groups, the project will feature a high-end retail mall, education institutions, a premium hotel and premium office spaces. On Sumitomo Corporation's interest in India, Narikiyo said that the company was attracted to India as it is politically very stable among emerging markets. "It is governed by democracy, the value we can share," he said. "Idea is to create a niche which Indian market had not seen," said Kapur. He further added that the apartment that may cost Rs 1-2.5 crore will have quality and facilities equivalent to those costing Rs 15-20 crore at present. Krishna Group has diversified interests in automotive components, travel, media, entertainment seating and real estate. Over the last 25 years, the corporation has formed over 21 international joint ventures and alliances. Sumitomo Corporation is a member company of the Sumitomo Group which has 400-year-old history and is a leading Fortune 500 global trading and business investment. Apart from real estate, its core business areas include metal products, transportation and construction systems, environment and infrastructure, media, network, lifestyle related goods and services, mineral resources, energy, and chemical and electronics.